I for one am having serious "buyer's remorse" with Fielder -- especially given that they are saddled with a DH-only sort of player for NINE (9) years. I can live with Cabrera's defense and third base and actually think he made himself into a relatively decent first basemen -- where I think he had much more range than Fielder displays. If nothing else, Cabrera (at 6'4") figured to reach a lot more off-the-mark throws at first base than Fielder. With Nick Castellanos hitting .411 at Lakeland, one has to wonder how long before he forces his way onto the scene as the Tigers' third baseman for the next ten years. 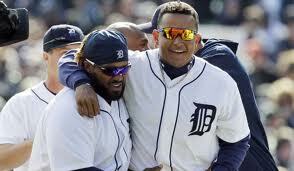 That moves Cabrera back to first, and places Fielder firmly as the full-time DH. Leyland has never liked having a full-time DH, but it looks like he'll be saddled with one for the next 7 or 8 years. Yeah, it appears to be quite evident that the Tigers downgraded both 3rd and first bases a lot more than anticipated. But we did know this was coming (bad defense) - and we were prepared to swallow it given it was going to be sweetened by a line up that was going to drive in twelve runs every game to outrace the other teams offense to the end of nine. The real story here is the inexplcable absense of hitting - top to bottom - except for Jackson who's out hurt. And Miggy and Fielder need to be hitting over .500 to outpace the opposition with this weaka** s**t.
And this to be one Verlander's story book years too. Pat, that is why if you can trade Porcello for another K pitcher you do it. Trade Porcello to a good infield defensive team. Pat, I think the Tigers are thinking like you beside they have not moved Castellanos from 3B yet. Nick has 337 minor league career batting average. He needs to be moved up to AA ASAP. Isn't it about that time of the year where Leyland starts passive-aggressively demanding his contract extension? not to Verlander and not to Cabrera (who both are more valuable than Fielder is). Look at the Pujols contract -- it was too big and too long...Pujols is finally starting to hit but at least Albert Pujols plays solid defense (unlike Fielder)....what concerns me greatly about Fielder is that he's too much of a one dimensional player to get several hundred million dollars -- this Boras contract was total insanity and DD and Ilitch may regret it for years to come...Fielder just doesn't have the range or ability to often play "adequate" defense over at 1B on a consistent basis...and so far Fielder hasn't been able to hit nearly enough to compensate for his defensive issues...In the recent series with the Indians Fielder had many opportunities to drive in the game changing runs BUT it didn't happen...and Miguel Cabrera is far superior to Fielder at 1B and I never liked his move to 3B (which puts tremendous pressure on the Tigers infield defense and so far Cabrera hasn't hit as well since moving to his new position). Hey Pat, I think what makes it worse is Prince seems to want to stay on the bag on pick off moves instead of moving to the ball, catching the ball or trying to catch the ball should be his # priority. Miguel just looks bad, he just doesn't seem very disaplined at his whole approuche to the game. I am also a long time Tiger fan and I think long run they can be ok, but they need to somehow change the makeup of this team. both these guys are making errors, but if the team hitting was better, there wouldn't be much attention directed at it. as is, they've had 17 of 45 games decided by 1 run, so all the little things get magnified. the team is flawed defensively at the corners...but doubt it will be a decisive factor on the season. like you say, nothing can be done about it anyway. one startling stat is that Tigers have been outhomered 41-46 through 45 games. if that trend doesn't reverse, the season will go sour.